Culture, craftsmanship, and creative thinking mixes old world aesthetics with contemporary design to build a family's Wyoming dream home. The Prairie Field stone (John Mills/Select Stone) is dry-stacked on the exterior, but inside it’s grouted to give it a more finished look. The standing seam metal roof features a soft, living patina finish. 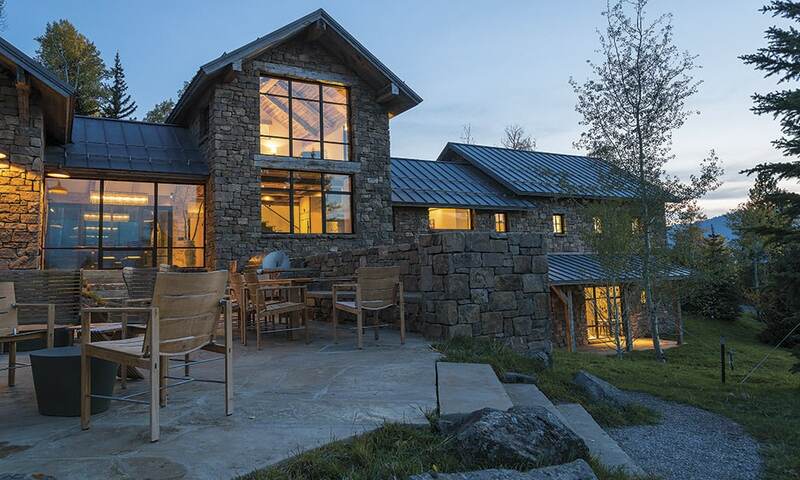 What do you do when your love of English stone cottages that dot the Cotswold countryside intersects with your affinity for the terrific Teton views and lifestyle of Jackson Hole, Wyoming? In the case of one adventurous couple, you find an architecture firm that specializes in serious craftsmanship and understands your vision and you build a home that beautifully blends the Old-World aesthetic you admire with modern amenities that fit your family’s needs. 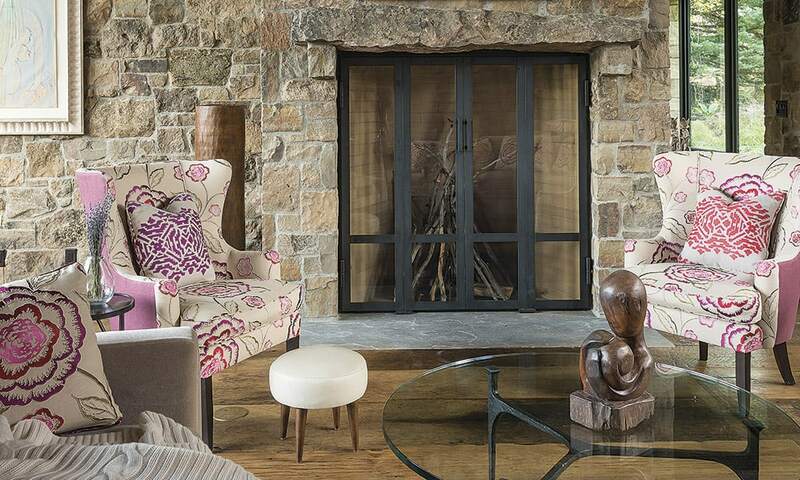 Floral wing chairs, covered in fabrics by Manuel Canovas and Loro Piana, flank the huge steel (steel fabricator Scott Espelin) and stone fireplace, adding an understated feminine flair. A beautiful table by Magpie WoodWorks sits atop the Frontier sandstone floor in the dining room. The scissor back chairs are from GM Décor (c. 1960, Italian). He praises the firm JLF Architects—which specializes in iterative and collaborative design-build projects—for truly listening to their wishes and for the firm’s ability to expertly transform ideas into plans. “They just got it, and basically did the whole project with us on the end of a telephone, and they did a fantastic job!” the owner says. The thresher oak floors, reclaimed from a century-old barn, are highlighted in the master retreat (Montana Reclaimed Lumber). The nightstands are from Codor Design, while the sconces are Marian Jamieson. The luxurious duvet fabric (Pollack) complements the upholstered headboard (Ablyss Upholstery/Mark Alexander fabric). 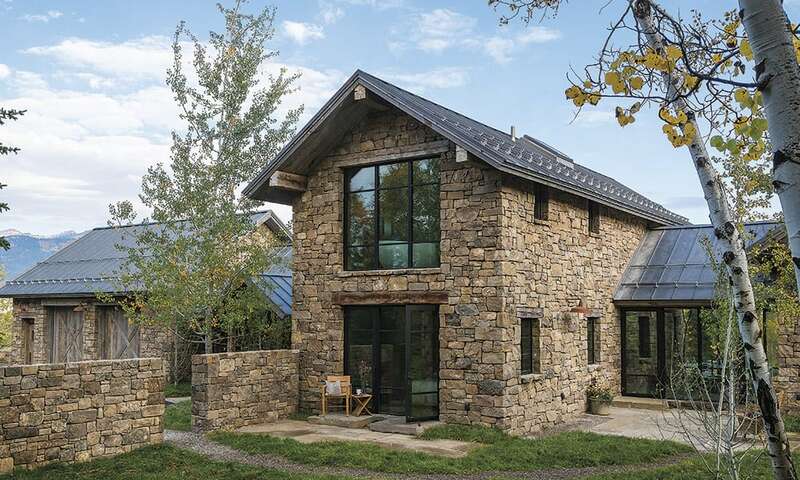 The 6,000-square foot main house, constructed of prairie fieldstone sourced from northeast Montana, sits on a 5.75-acre lot and has four bedrooms, five baths, and a powder room. A recent addition added another 2,000 square feet comprising two additional bedrooms, two full baths, a powder room, and a large multi-functional entertainment area. Additional outdoor living space was also added to capitalize on the views of the Teton Mountain Range that stretch all the way to Yellowstone National Park. The use of glass tiles in the kitchen creates a contemporary feel that is juxtaposed with the rustic wooden ceiling. Cabinets are custom designed by JLF Architects. 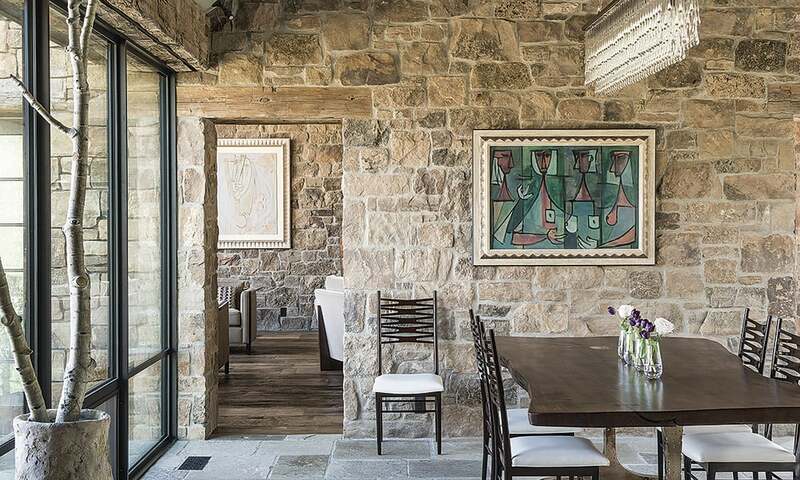 In the main living room, the stone walls—identical to the stone used outside, but grouted on the inside to create a more finished look—are accented by reclaimed 100-year-old oak floors in various widths that were salvaged from barns used for threshing wheat. 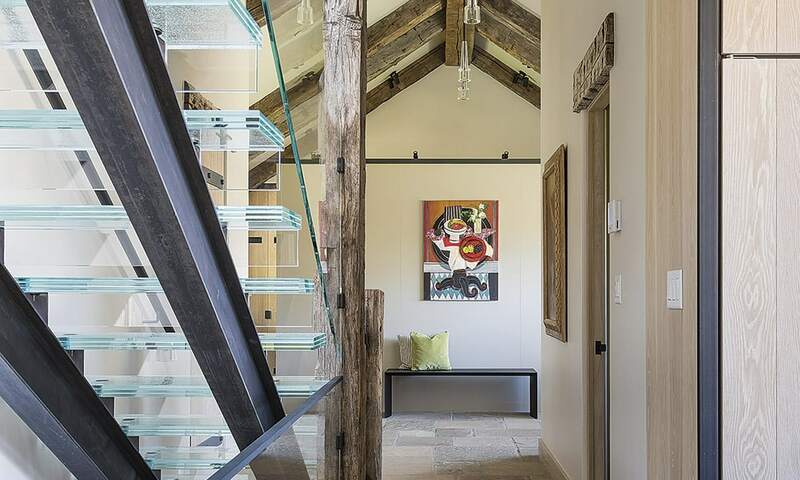 The ceilings feature reclaimed oak planks and trusses of hand-hewn heavy timber. In the dining room, tall walls of windows allow a transparency that is intentional to maximize the views of the Tetons. The sandstone floors in this room are mimicked on the outdoor terraces, accessible through the end glass doors. The glass staircase, supported by steel beams, soars three flights. A skylight above the stairwell acts like a spotlight for this stunning feature. The other doors in the home—designed and built by the architects, a signature of theirs—are oak with forged-iron strapping details and hardware. The understated entry is subtle and features a custom-made door of thresher oak—the same material used for the flooring—and reclaimed corral board for the siding. Similarly, the cabinets—complete with semi-transparent glass tops in the bathrooms to add a contemporary flair—are designed by JLF. In the tranquil master bath, custom cabinetry by JLF Architects features semi-transparent glass tops. The components are from Dornbracht, while the free-standing tub is from Waterworks. The use of glass in the home is a consistent element that adds a contemporary layer to contrast the rusticity that dominates. The luminous glass elements add visual interest and show up in the form of translucent bathroom countertops, oversized tile kitchen backsplash, and the stunning three-story staircase. A skylight above the stairwell illuminates the stairs, and the glass treads allow light from the upper level to flood through to the main and lower levels. 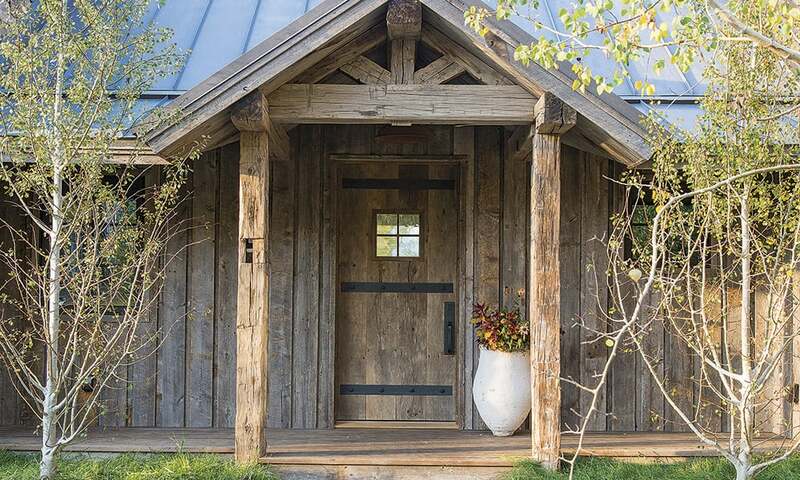 The understated front entry showcases reclaimed corral board siding and rustic reclaimed hand-hewn timbers. The old wood door, a signature of JLF Architects, is also made of reclaimed wood and features rustic iron strapping detail. The interior design choices, selected with the help of Jackson interior designer Tayloe Piggott of Tayloe Piggott Gallery, intentionally blend with the outdoors, but also reflect the international vibe of the couple. The stone flooring from the dining room is carried onto the inviting outdoor terrace where the views of the Tetons take center stage. Colorful Cuban art—a nod to his heritage—graces the walls, while she chose Scottish furniture with a feminine flare. None of it is overpowering, and it all works together in its simplicity. 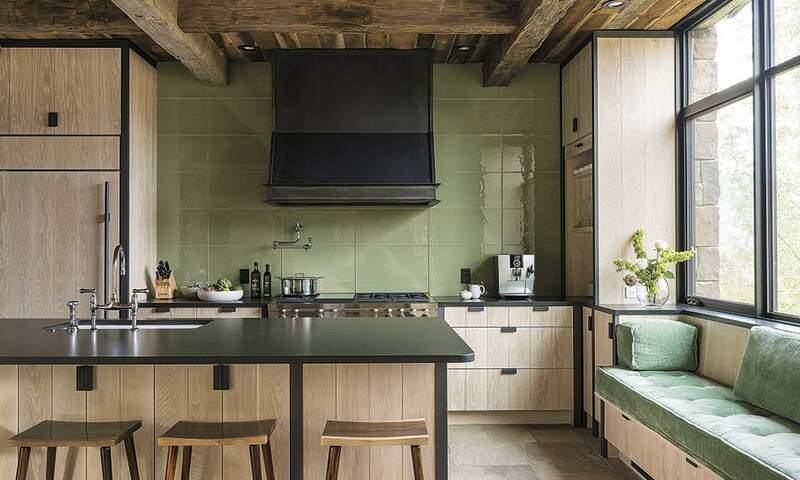 The primarily neutral palette is peppered with surprises, such as the use of cheery green bench cushions in the kitchen and pops of pink floral on the living room chairs, that stand in contrast to the rugged use of stone, timber, and steel throughout the home.